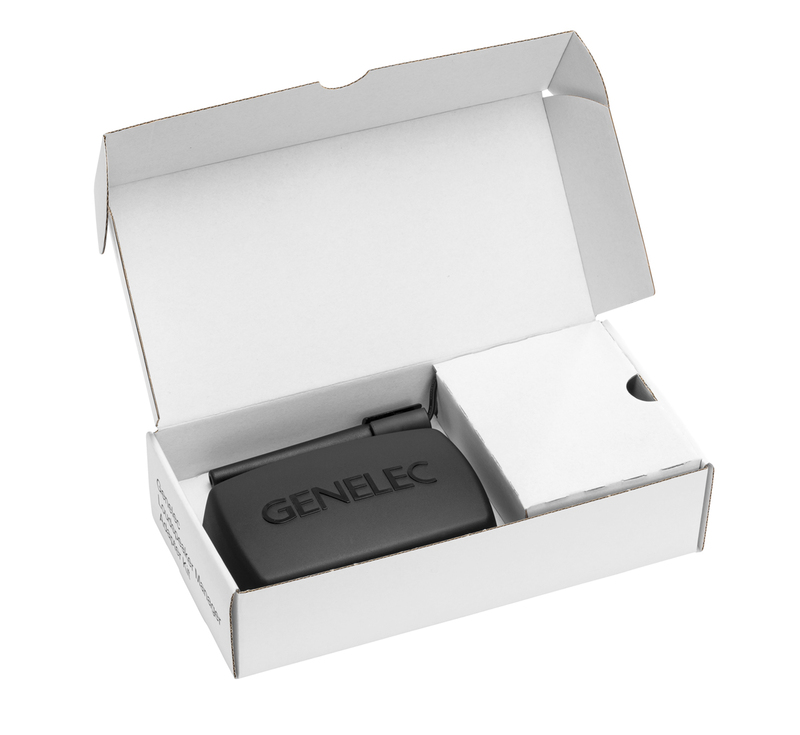 Genelec’s GLM™ 2.0 User Kit. Genelec’s GLM™ 2.0 User Kit, assembled. 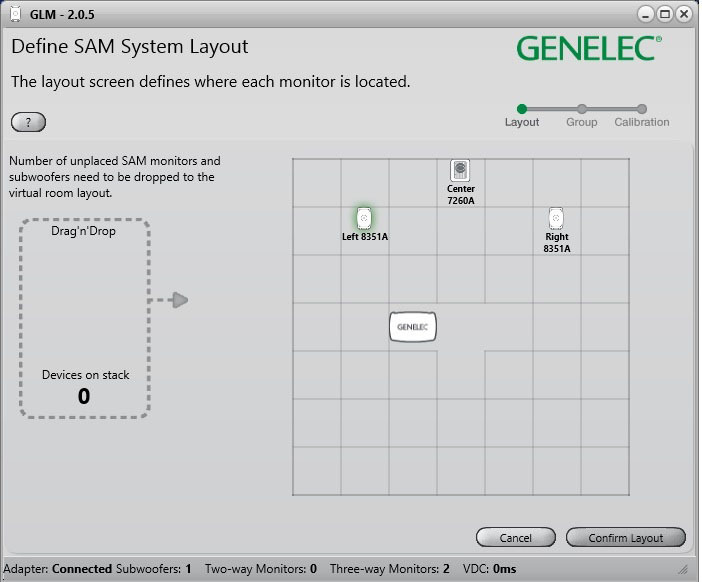 Genelec’s GLM™ 2.0 screenshot (layout screen). NATICK, MA, October 19, 2015 — Genelec, the pioneer in active loudspeakers, offers GLM™ (Genelec Loudspeaker Manager™) V2 of its software, a highly intuitive and powerful monitor control networking system that manages connectivity to all models of SAM™ (Smart Active Monitoring™) studio monitors and subwoofers – up to 30 on the network – covering all types and sizes of stereo, multichannel, or 3D immersive audio applications. The simple, intuitive GLM 2.0 software is available for Windows and Mac and features automatic adjustment of levels, distance delays and flexible room response compensation equalization with the state-of-the-art and robust AutoCal™ calibration system. All parameters and settings are stored in GLM system Setup files or internally saved in the monitors and subwoofers if the GLM network needs to be disconnected. With its fast and intuitive user interface, users can adapt any of 16 models of Genelec SAM monitors to virtually any listening environments with GLM 2.0, allowing reduced perceived differences between listening environments or positions. GLM AutoCal provides the industry’s first integrated process for complete automated measurement, analysis, and adjustment of every monitor on the GLM control network, using a factory-calibrated Genelec 8300A acoustic measurement microphone (included). Updated features for V2 include a new Network Adaptor that has both microphones and volume control inputs; the expanded use of Groups in a Setup; independent input types for each Group (analog or digital); independent AutoCal settings for each Group; five Groups available for each Setup; SPL display on the main GLM screen; and more. The upgrade path for users who want to update their GLM from V1 to V2 is easy and intuitive. After the user contacts Genelec, the upgrade fee is $375 for a new User Kit, and they will be credited $275 when they send back their old Network Interface Device. Automatic calibration of levels and distance-compensating delays for accurate and stable sound stage imaging. Ability to store calibration settings for different listening positions to be recalled instantly during the production stage. Allows repeatable and consistent performance, enabling accurate monitoring in any production environments. Symmetrical or individualized stereo pair equalization compensation to be used depending on the acoustic environment. Subwoofer crossover phase is set for all subwoofers on the network to achieve smooth frequency response transition around the crossover point. Each monitor Group has its own AutoCal calibration file, allowing the use of different Groups for various customized response curves. Groups contained in one GLM system setup file can feature both analog and digital input use and an unlimited number of system setup files can be created. Volume control functions via GLM software master fader or via external wired or wireless volume controllers, covering all possible applications. On-screen, real-time SPL reading of the active monitor Group allows careful monitoring of the production SPL. 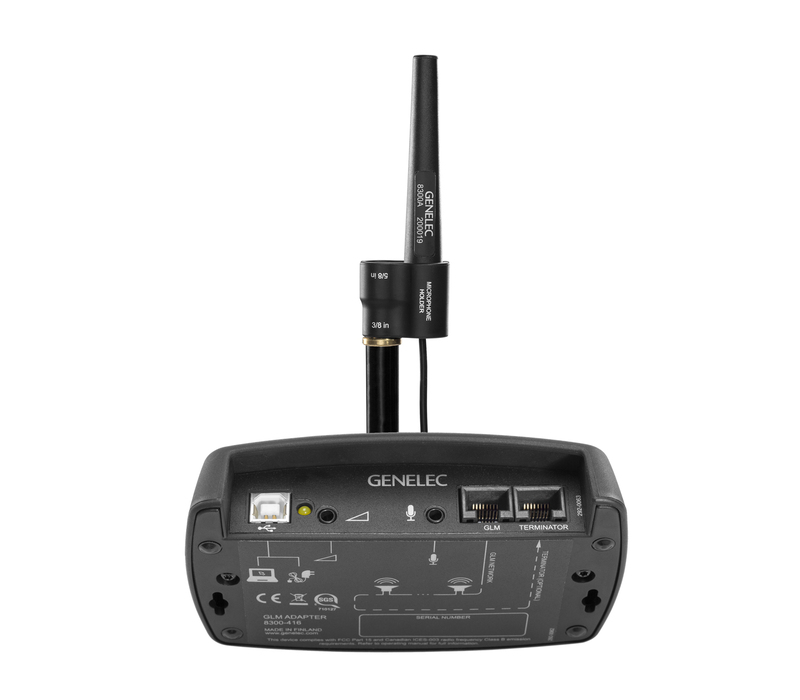 Photo Caption 1: Genelec’s GLM™ 2.0 User Kit. Photo Caption 2: Genelec’s GLM™ 2.0 User Kit, assembled. Photo Caption 3: Genelec’s GLM™ 2.0 screenshot (layout screen). 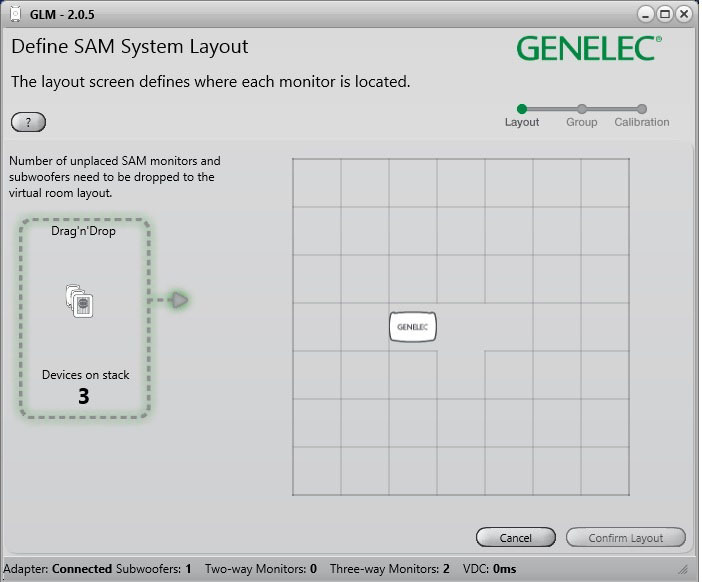 Photo Caption 4: Genelec’s GLM™ 2.0 screenshot (layout screen).